Once again, Dictator Donald Trump (DDT) has been forced to back down, this time from his anti-U.S. intention to turn U.S. government employees over to Vladimir Putin. As the Senate prepared to vote on a resolution opposing DDT’s honoring Putin’s request, Press Secretary Sarah Huckabee Sanders stated that DDT “disagrees” with the “proposal that was made in sincerity by President Putin.” He had suggested swapping the 12 Russians indicted last week for 11 current former U.S. officials. The resolution stopping many government officials from being turned over to Russia for questioning passed the Senate by 98-0. Sens. John McCain (R-AZ) and Richard Shelby (R-AL) were absent for the vote. Republicans did reject efforts to support the intelligence community’s assessment, Mueller’s probe, and implementation of congressional sanctions. None of these resolutions would have been binding on DDT. Two years ago, Senate Majority Leader Mitch McConnell (R-KY) stopped President Obama from making public the information about Russia’s hacking and election interference with accusations that it was a partisan move. No more. Despite the indifference of Republicans in Congress, DOJ’s Rod Rosenstein has a new policy to tell the U.S. companies, organizations, and others who are being attacked by foreign hacking and disinformation campaigns. He said, “The American people have a right to know if foreign governments are targeting them with propaganda.” A Microsoft executive told the audience at the Aspen Security Forum today that Russia has target at least three candidates this year. In another interview at the Aspen Security Forum, Homeland Security Secretary Kirstjen Nielsen explained that removal of thousands of children from their parents is “to protect children.” She added that the courts—that actually require her to reunite children—are preventing families from staying together. In another noble move on her part, “we give a pregnancy test at DHS to every girl over 10.” It is her agency that imprisons pregnant girls to keep them from having any abortions unless courts manage to allow them to see doctors. Her claim that DHS gives aid to members of radical extremist groups who want to be non-violent is negated by her administration rolling back funds for this rehabilitation. The outstanding part of her responses was the support for “both sides” being to blame for the Charlottesville violence: “It’s not that one side is right, one side is wrong.” The official DDT administration position is that white supremacists are not wrong. DDT has found another way to get rid of people he considers undesirable. Applicants for asylum visas no longer have 30 days to take care of missing or inaccurate information on their applications. The new policy is to immediately deport them with no advance warning—just a final statutory denial. They will be treated like criminals, who are also deported on a fast-tracked basis. [If only we could automatically reject DDT’s nominees who provide forms with missing or incomplete information!] The new policy politely states that it is “not intended to penalize filers for innocent mistakes.” AG Jeff Sessions also disallows domestic and gang violence claims as bases for asylum; those seeking asylum must provide evidence that they fear persecution based on race, religion, nationality, social group, or political opinion. Fear of death doesn’t count. On Fox’s Tucker Carlson show, DDT accused Montenegro of being responsible for starting World War III if it joins NATO because its people are “very aggressive.” Montenegro’s Prime Minister Dusko Markovic came into the limelight a year ago when DDT aggressively pushed him out of his path at the 2017 NATO meeting. [Full video here.] The country of 630,000 alienated Russia because it planned to join NATO: the Kremlin may have meddled in its elections, and pro-Russian militants planned a failed 2016 coup. NATO has an agreement that the other 28 members will support any one member attacked from outside. In its 69-year history, that agreement has been invoked only once—when 28 members went to the aid of the United States after the 9/11 attack. NATO members are still in Afghanistan after 17 years of the U.S. war there. Israeli Prime Minister Benjamin Netanyahu convinced DDT to drop out of the Iran deal, according to a video of Netanyahu’s speech to his Likud party. About 40.6 million people—12.7 percent of the population—lived below the official poverty line in 2016. The Supplemental Poverty Measure shows that 14.5 percent of people in the U.S. are impoverished. Over 20 percent of children in the U.S. live in poverty. The United States was second only to Israel of the richest countries with the percentage of people in poverty in 2014. Poor people finance their spending with debt—payday loans, second mortgages they can’t afford, etc. The cost of living for DDT’s report is adjusted more slowly than the official Consumer Price Index, making household spending appear to be growing faster. EPA Scott Pruitt and his corruption may be gone, but the United States still has Interior Secretary Ryan Zinke. After several reports of his illegally using taxpayer money, his own department’s IG is investigating the man responsible for protecting public lands about his real estate deal with Halliburton Chair Davi Lesar. The foundation run by Zinke and his wife granted Lesar’s real-estate development the permission to put a parking lot on land donated to the foundation for a Veteran’s Peace Park in Whitefish (MT). Zinke is also under investigation for a violation of the Hatch Act after tweeting himself wearing socks with DDT’s face and “Make America Great Again” campaign slogan. Halliburton is one of the world’s largest fracking and offshore drilling companies; Zinke repeatedly opened up federal lands and coastal waters for fossil fuel drilling. Rep. Trey Gowdy (R-SC), known for his frequently obnoxious grilling of Hillary Clinton, John Brennan, Peter Strzok, and others regarding their possible connections with foreign countries, has been revealed as a beneficiary of foreign monies for his election from his superpacs, including Great America PAC, that may also fund Russia’s attack on the U.S. election. The PACs’ major donors have direct ties with Cambridge Analytic, now defunct, that helped elect DDT through data collection, hacking, and social media manipulation. As chair of the Oversight Committee, Gowdy refused members 52 times to request subpoenas for interviews in the Russia probe. He will not be running for re-election. ALEC, the powerful organization that writes conservative legislation for lawmakers, has lost ExxonMobil after Ford, Google, Microsoft, Coca-Cola and many others left the group. The biggest oil and gas company in the world followed BP, Royal Dutch Shell, and ConocoPhillips in abandoning the Koch Brothers’ group after a disagreement about an ALEC resolution that would ask the feds to reconsider its findings that greenhouse gasses are harmful to human health. A major contributor to the secretive organization since 1981, Exxon has given millions to promote the conservative corporate agenda. Its departure comes in the midst of state investigations into its connection with hiding evidence about its climate impact from its shareholders as well as the public. The classic for today comes during an interview at the Aspen Security Forum when NBC journalist Andrea Mitchell tells Director of National Intelligence Director Dan Coats the breaking news that Vladimir Putin is coming to Washington this fall. The video is not to be missed. The best part may also be that McConnell said that Put will not be coming to Congress. 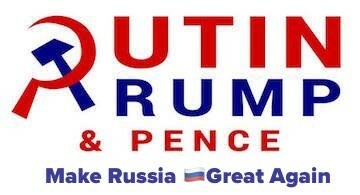 I’m sure that DDT wants to be alone with Putin anyway. The question is how long Coats will keep his job. And that’s just one day for DDT’s administration. That was a summary of today’s brief meeting between Dictator Donald Trump (DDT) and Russia’s Vladimir Putin, the man who may have given the presidency to DDT. Three days before DDT journeys to Helsinki to present the United States as a gift to Vladimir Putin, 12 Russian intelligence officers were indicted with hacking the DNC and the Hillary Clinton campaign before release the stolen emails to “interfere in the 2016” election. Deputy Attorney General Rod Rosenstein said he briefed DDT on the indictments earlier this week. Yet DDT continued to present the Russian scandal as a “witch hunt” and said that the Putin meeting would be “easier” than his participation in the NATO summit and visits in the UK. He also said that the DNC was to blame for the hacking because it didn’t have enough protection. What actually happened in Helsinki? Putin showed up late—just as DDT did for his dinner with UK PM Theresa May and tea with Queen Elizabeth II. Before the meeting, DDT blamed the U.S. for any problems with Russia. Putin said he didn’t have anything to do with the U.S. elections, and Trump agreed with him. Asked if he wanted DDT to win the election, Putin said, “Yes, I did.” Putin also indicated that he told his people to help DDT win. Putin: lift sanctions by the U.S. and its (former?) allies, pull back NATO forces near Russia’s borders, accept Syrian army deployment on the Israeli border, reinstate business as usual with Moscow, get the U.S. to acknowledge Russia’s influence over its former Soviet neighbors, and recognize Russia as a global player. In the Helsinki meeting, DDT has continued his slogan of “Russia First.” He has abandoned U.S. international influence by leaving the Trans-Pacific Partnership, Iran nuclear deal, Paris Climate Agreement, and UN Human Rights Council while threatening to leave the World Trade Organization and NATO. He has further weakened U.S. global power and expanded that of Russia by cutting the State Department budget and foreign aid. His bullying has increased Russia in Central America where Russia is providing aid, reopening military bases, and building a satellite-tracking station to spy on the U.S. His rejection of Cuba allows Cubans to turn back to Russia. And he has alienated all U.S. allies with trade tariffs and insults. Before and during the Helsinki meeting, DDT showed nothing but weakness. His words showed helplessness in trying to get Putin to stop meddling—if, indeed, DDT might not believes Putin’s denials. DDT said, “What can I do” if Putin denies meddling. “I don’t see any reason why” Russia would interfere in the election, DDT also said. Russians made DDT wealthy; he cannot cross them. Ultra-right Drudge Report’s lead headline, “Putin Dominates in Hel,” was accompanied by DDT’s awkwardness. Abby Huntsman, a conservative commentator and daughter of US ambassador to Russia Jon Huntsman: “No negotiation is worth throwing your own people and country under the bus”. House Speaker Paul Ryan (R-WI): “There is no question that Russia interfered in our election and continues attempts to undermine democracy here and around the world. U.S. handoffs to North Korea with nothing in return set up the scene for DDT’s meeting with Putin. Just the meeting, like DDT’s meeting with Kim Jong-Un, makes Putin the winner in what DDT erroneously calls a “summit.” Having a diplomatic meeting and not giving away U.S. activities for nothing may not be a problem; DDT’s meeting with Putin displayed neither of these. DDT’s creation of chaos by attacking Europe and starting a trade war with closest allies of the U.S. has already made Putin the victor. Now that DDT has trashed the U.S. with his pandering to Kim Jong-Un of North Korea and Vladimir Putin of Russia, he plans to talk to the Taliban. What can go wrong?